"A few months back I saw a video on Youtube of the British Army using tankettes and small mechanized units on maneuvers before WW2. Watching the video I thought of what an actual battle between two forces armed the same might look like. It started me thinking of doing some interwar games. With several other bloggers doing interwar gaming, there are plenty of good ideas for such gaming….."
I'm currently working on some fictional armies for 1929-- regimental to division level. A trial run of rules is scheduled for the 6th. Most of the powers who had tanks divided them into Infantry and Cavalry tanks. The Infantry tanks were parceled out to Infantry units to assist in breakthroughs. The Cavalry tanks were supposed to exploit the breakthrough and get into the enemies rear. I suspect that your 1929 armor would mostly be WWI armor with some improvements and experimental vehicles that had limited production. "I suspect that your 1929 armor would mostly be WWI armor with some improvements and experimental vehicles that had limited production"
Exactly right-- first up are some A7Vs for the Franconians; the Landships site is a great inspiration for some of the stranger vehicles. "Over the Top" orders of battle for late WWI are a starting point, with speculative add- ons during the succeeding decade. Your problem is that all of the nations that took part in WWI did cut backs to military budgets (spent huge amount for the war and had huge surpluses of weapons) and could not make major military purchases. 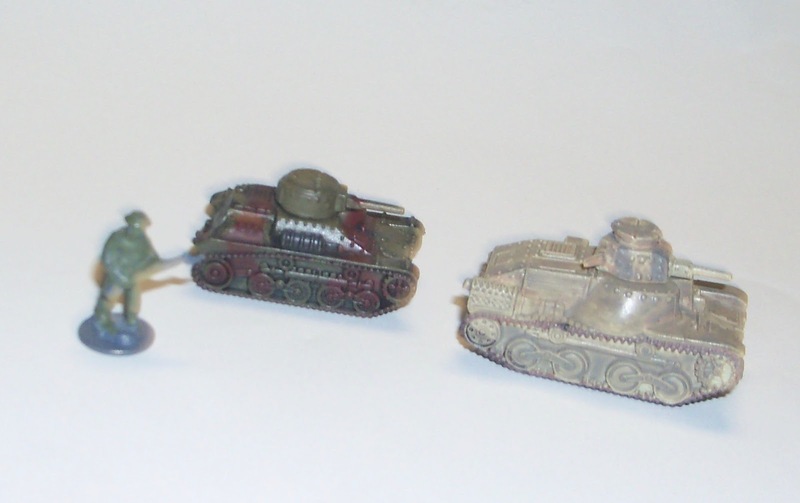 If you go into the middle 1930's you will start to see some upgrades in armor vehicles. There is a Bunkermeister Facebook group for Interwar US Army tanks. I am gradually working on a US Army 1938 unit. Check out images 46 and 47 for Oct. 2018; card models from the Landships 2 site resized to 1/144. Infantry are old Scruby/Historifigs N-gauge.